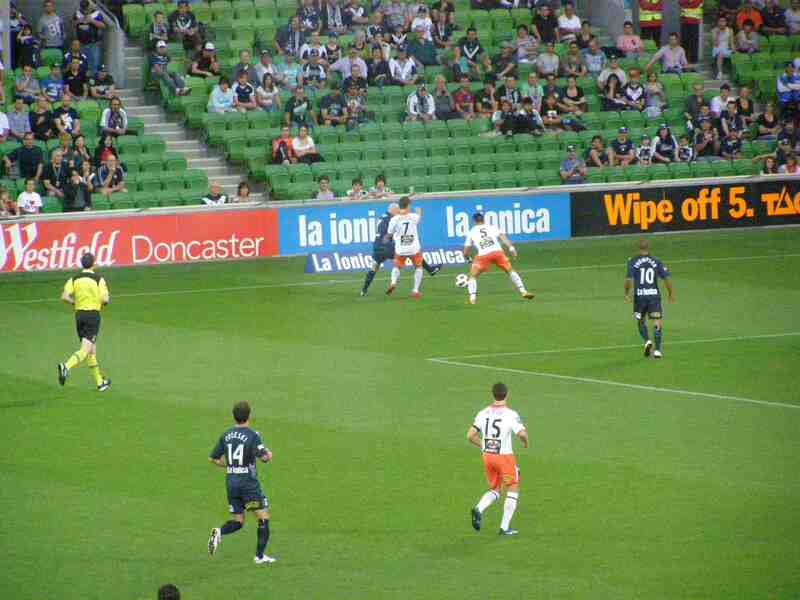 In a six-goal thriller at AAMI Park, Melbourne Victory fought back from two goals down to take the lead at 3–2 deep in the second half before conceding a goal in injury time to give Brisbane Roar a share of the points. Matthew Kemp made a welcome return to the Melbourne Victory line-up for Friday night’s A-League match. 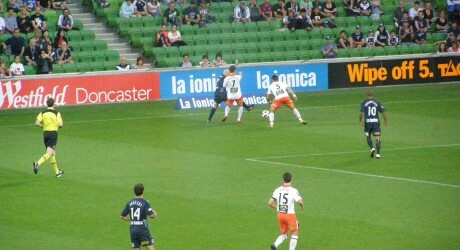 In the absence of Adrian Leijer he slotted straight into defence alongside skipper Kevin Muscat and Rodrigo Vargas. Unfortunately after only half an hour he conceded an own goal when Thomas Broich’s teasing cross from the left was flying across the goal area and Kemp’s head deflected it past Michael Petkovic. Behind him roar striker Jean Carlos Solorzano would probably have done the same as he was already throwing himself at the ball. That brought to an end a period of Victory dominance in which Carlos Hernandez, Archie Thompson and Robbie Kruse all had chances to give the home side the lead. The goal changed the complexion of the game and Roar settled into an excellent passing rhythm. In the first minute of injury time at the interval, Matt McKay’s swinging corner was headed on to the bar by Matt Smith and Jean Carlos Solorzano got a boot to the rebound ahead of Rody Vargas to force it over the line for the Roar’s second goal. Surat Sukha replaced Leigh Broxham at half time and Victory set out to salvage some pride. The second half was transformed when Kevin Muscat, Grant Brebner, and Carlos Henrandez worked the ball through to Robbie Kruse who passed it just inside the right hand post in 63 minutes. That brought the 11,886 crowd to its feet and eight minutes later Victory was level. Carlos Hernandez knocked over a cross from the left, Kruse flicked it on with his head and Archie Thompson with an instinctive header deflected the ball over Michael Theoklitos. Another five minutes and the momentum had completely swung Victory’s way when Hernandez was brought down just outside the area. His free kick flew through the wall and though Theoklitos got down smartly to block the initial shot, the rebound was tucked away by Kruse. Victory kept pressing and Archie Thompson missed narrowly with a chance to seal the result. Three minutes into injury time Brisbane skipper Matt McKay chased a loose ball into the Victory penalty area. Michael Petkovic got his body behind the ball but it rebounded against the onrushing Vargas giving McKay a chance to tap it into the unguarded net to the delight of the visitors and there small band of fans. 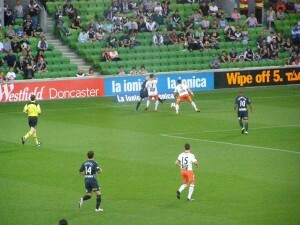 Victory fans and later the team were incensed that Roar keeper Michael Theoklitos had apparently handled the ball outside his penalty area before thumping a long ball downfield which McKay later converted into the equaliser. Melbourne Victory FC squad: 1.Michael PETKOVIC , 2. Kevin MUSCAT, 6. Leigh BROXHAM (5. Surat SUKHA 46), 7. Matthew KEMP, 8.Grant BREBNER (13. Diogo FERREIRA 80’), 10. Archie THOMPSON, 11.Marvin ANGULO, 12.Rodrigo VARGAS, 14. Billy CELESKI, 16.Carlos HERNANDEZ, 21. Robbie KRUSE (3. Mate DUGANDZIC 82’). Yellow cards: Kevin MUSCAT 55’, Rodrigo VARGAS 74’, Carlos HERNANDEZ 81’. Brisbane Roar FC squad: 1. Michael THEOKLITOS, 2. Matt SMITH, 3. Luke DEVERE, 5. Ivan FRANJIC, 6. Erik PAARTALU, 7. Kosta BARBAROUSES, 9. Jean Carlos SOLORZANO (11. REINALDO 74’), 15 Matt McKAY, 17. Mitch NICHOLS (18. Luke BRATTAN 72’), 22. Thomas BROICH, 23. Milan SUSAK (12. Matt MUNDY 63’).